Curly hairstyles have become quite popular in the recent years, especially the short curly hairstyles and haircuts. A lot of celebrities nowadays prefer to go with short curly hairstyles. If you’re looking for the latest trendy hairstyles, you won’t go wrong with short curly haircuts which are the ideal solution for most modern women. Actually, lots of different styles are in trend with the short curly hairstyles which make you look more trendy and elegant. Before getting this style, it’s smart to know that the best versions are usually hairdos which have sufficient room for play. There is a wide range of short curly bobs to choose from, with asymmetric hairstyles such as A-line bobs, angular reverse bobs and stacked back bobs which always look absolutely fantastic on the naturally curly hair. There are also lots of retro hairstyles which look amazing on short curly haircuts. For instance, you can try out the finger wave (which is also known as the head wave) which creates an amazing wavy pattern all around your head’s frame, without adding any extra volume. This short curly hair is very easy to style and design into textured pixie cuts, which do not have the traditional round curls. For instance, with all that natural volume which curly hair normally gives, one can achieve some spiky strands for a more contemporary look that is hot, and only requires a light touch of a styling product, then followed by finger styling. This is a rather popular easy short curly hairstyle. It produces a very lovely and fascinating look that is youthful, yet very flattering for girls or women of all ages. The current top styling trends include; the casual and tousled finish, and the defined, separated petal short curls which are perfect on the short curly hair especially for special occasions. If you’ve got a round face, do not worry, you can also enjoy an amazing short curly hairstyle. One of the most amazing and flattering hairstyles to those with slim chubby cheeks is the pixie cut which features lots of textured volume of hair at the top, and then tapered down to the sharp points on the sides. Balayage highlights always look very attractive on the curly hair since they can easily create different effects which are designed to properly accentuate your mouth, eyes and cheeks. To soften the facial features, you can have some strands lightened so as to make a more gentle frame around your face. This curly hairdo is so trendy right now. Everywhere you look, you will see your favorite celebrities donning the curly vintage style, especially those who are blessed with all natural curls. To keep the 40’s style in full glamour, skip highlights, and stick to one solid color. This is another magnificent short hairstyles for curly hair as it gives you a natural look which is lowkey, but with a lot of personality. For a hairstyle that looks brilliant on a thick wavy hair, you can choose layered cuts with some side swept bangs. You should also add definition to your locks with styling pomade and it will get you all the attention you need. Being blessed with some natural spirals usually comes with lots of maintenance. However, if you choose this cute short curly bob hairstyle, you will be able to easily maintain your hair. Keeping the front a bit longer, and the top full of volume basically makes this style quite easy to pull off. This is perfect for women with short haircuts especially during corporate events. For more glamour, the curls can be crafted artfully so as to create a more decorative look that can be complemented with some nice earrings. 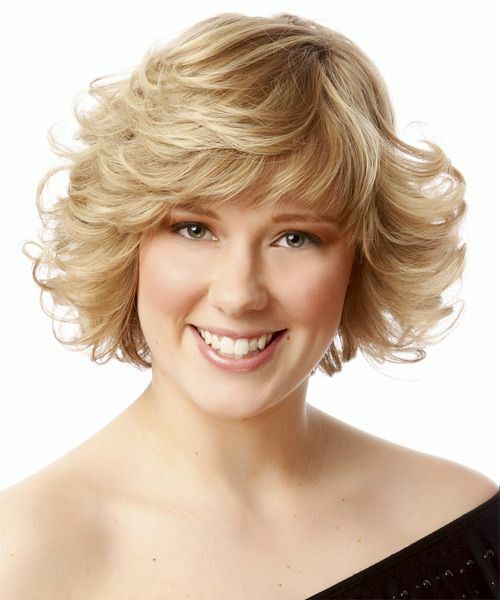 This short sassy curled hairstyle is full of playful curls at the back, and is very smooth on the upper bangs area. This hairstyle is perfect to go from school to work and even out in town. Think Footloose or Flashdance or any of the classic tv shows and movies which came out in the 70’s-80s. This hairstyle is big with curls, accompanied by dramatic bangs and a little feathering. This hair curls can easily be styled and maintained beautifully. Using a very good quality hair oil or hair serum will do the magic every morning in bringing out the shine and beauty of this hairstyle. Women who have thinner hair usually wonder how to go about styling their locks. Well, short elegant S-waves will provide lots of lift to a simple curly bob. With a medium sized barrel curling iron, you can add S-waves to both the upper and under layers for the hair.